Yesterday I talked about quark stars. These are hypothetical stars similar to neutron stars, but smaller and a bit more massive. Their gravity and density would be enough that instead of being largely made of neutrons (which are made of up and down quarks), they would be made of free up, down and strange quarks. If such quark stars exist, they would lie between neutron stars and solar mass black holes. But how can we tell a quark star from a neutron star? If it has reached a stable state, then a quark star should be smaller than a neutron star, say 10 – 12 miles in diameter versus 15 – 20 miles in diameter, as you can see in the figure below. This is a difference of only a few miles. Given that these stars are light years away, making measurement of a star’s size precise enough to tell them apart is a huge challenge. It would help if we had a complete equation of state for a quark star so that we could compare things like size and temperature, but we don’t. So it can be very difficult to distinguish a quark star from a neutron star. That’s assuming quark stars exist, which we aren’t sure is the case. 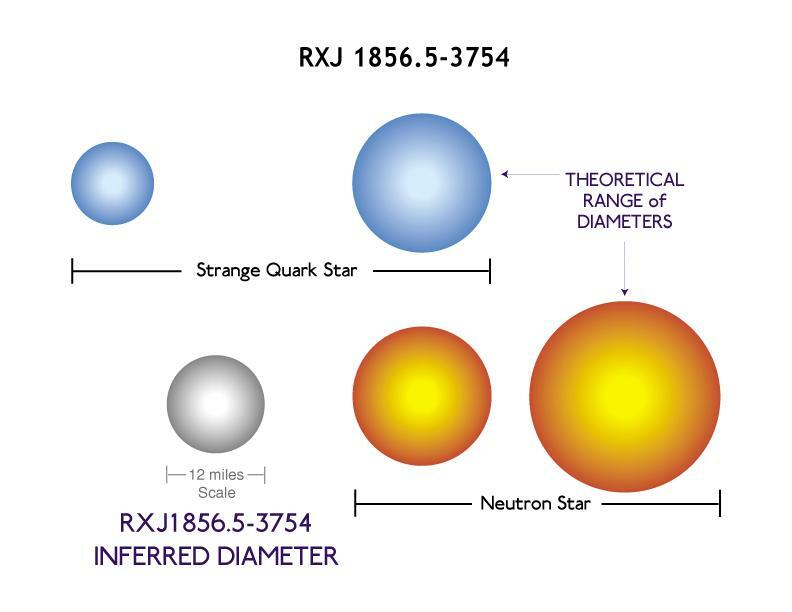 In 1992 a possible quark star was discovered, named RX J1856.5-3754 (great name, eh?) and it’s measured diameter was about 12 miles, which would make it too small to be a neutron star. But this was assuming it was about 200 light years away, and it was later determined to be about 400 light years away. As a result it is closer to 17 miles in diameter, which makes it too big to be a quark star. Measurements of its temperature also confirm it is a neutron star. This happens to be one of the closest neutron stars to Earth, and even then it took a great deal of effort to pin down its size. So it isn’t very likely that we will be able to distinguish quark stars from neutron stars by their size. At least not with our current instruments. There may be another way to distinguish them. Neutron stars are quite hot when they form, with surface temperatures of several hundred thousand Kelvin. Since they don’t have any way to generate heat, they gradually cool over time. A neutron star massing 2 – 3 solar masses will eventually cool and shrink slightly until it reaches a stable state where the neutron pressure balances its gravity. But a more massive neutron star would cool and shrink until it reaches a critical point. If it is too massive to stabilize as a neutron star, it will reach a point where the up and down quarks can collide hard enough to become strange quarks. This would induce a phase change from neutron matter to strange matter (a mixture of up, down and strange quarks) within a few milliseconds. This phase change would also produce large quantities of neutrinos. The quark star would be so dense that the neutrinos couldn’t escape all at once. But they could escape faster than photons. This means that after the phase change a quark star would cool faster than a neutron star. Interestingly, we’ve seen just this effect in a star known as 3C 58. This object appears to be a neutron star, but is cooling faster than expected. It’s possible then that 3C 58 is a quark star. Of course to know for sure, we need to pin down its size and other properties. It might just be an unusual neutron star. So 3C 58 is a candidate quark star, not a confirmed one. There are a handful of other candidates as well. At the moment, though, there is no confirmed quark star. They remain a hypothetical possibility.